If four out of five people in this country are enough to convince you to use a certain toothpaste, then four out of five people in the world should be enough to convince you to ride a bike. Get the one ridden by the entire population of China -- which includes at least several dentists -- Flying Pigeon Bicycles. Just now available in North America thanks to a Canadian e-tailer, this two-wheeler's popularity in The Middle Kingdom has already made it the most popular mechanized vehicle on the planet, and inspired Deng Xiaoping to define prosperity as "a Flying Pigeon in every household", making that "chicken in every pot" sound even more bland. 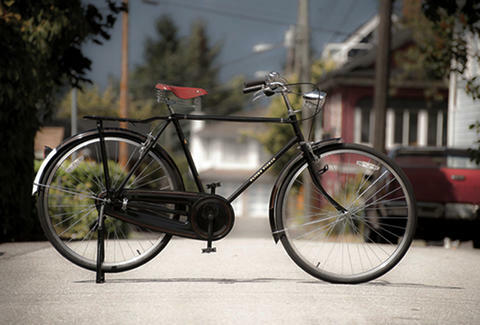 First dropped over 60yrs ago as the PA-02, the rugged single-speeder boasts a utilitarian black frame fitted with many of the original features (fully enclosed chain case, rear rack), and is made entirely in China, where interestingly, a standard FP'll run you just 36 bucks, which, coincidentally, is also the number of players, in addition to Jon Brockman, that team'd need to be any good. This still-affordable-but-considerably-more-than-$36 version has been readied for American ridership with upgraded cable brakes and splatter-proof fenders, plus modern tires and pedals, leather seats, and parallel handlebars in the "Dutch-style", so they look awesome, but may be a little (first) date-ed. And because water's such a passe way of re-hydrating after a ride, FP's slinging durable-but-stylish leather/brass wine saddles that attach to the bike's frame and they call a "charming extra", also the sugarfree gum four out of five dentists hate, because they're not riddling your teeth with money-making cavities.